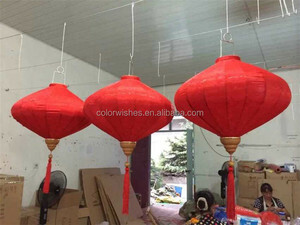 3, Various types available: hanging lantern, wall lantern, table lantern, floor lantern, water lantern, etc. 4, We can make various shapes lanterns: round, egg, square, balloon, star, flower, accordion, watermelon, image, animal, irregular. 6, Professional export packing, strong carton make sure transportation safe enough. More detailed picture of the lantern: You can choose lanterns you like from below picture. We can also do customized lanterns. Just conatct us and tell us your detailed requirement. 4 YRS Xi'an Silk Road Crafts Co., Ltd.
We persist in providing customers with quality products at reasonable prices in the Worldwide Market. 3. More than 10 years production, we know how to avoid mistake and control the quality in ever process. 4. Cooperation with many express companies makes the shipping more favorable. 3 YRS Yiwu Color Wishes Crafts Co., Ltd. 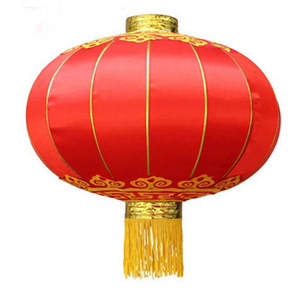 Hanging Waterproof Fabric Chinese Traditional Blessing Silk Lanterns Material Silk (waterproof) Shape Diamond, Round, Heart, Oval, UFO shape Size 12"-34", or as your request Colors Red, Yellow, Blue, Green, Pink, Orange, Purple, Fuchsia MOQ 100 pcs Design Customized design, logo are available Usage Wedding, Party, Chinese New year, Holiday celebration. Packing 1pc in one opp, 1pc/inner box, 25pcs/ctn Shipment way By sea or by air or by express (DHL / UPS / Fedex / TNT) Product Specifications Dimension Height (when folded) Heigth (when Unfolded) Width ( when Unfolded ) Qty per carton Carton Size 12" 46 37.5 30 25 54*50*54 14" 55 43.5 35 25 57*54*54 16" 60 48.5 40 25 66*58*58 18" 66 51 45 25 71*58*58 20" 72 55 50 25 77*58*58 22" 78 60 55 25 83*58*58 24" 85 66 58 20 88*47*58 26" 95 71 63 20 100*47*58 28" 104 77 66 20 109*47*58 30" 115 83 70 20 120*47*58 32" 125 89 75 20 130*55*68 34" 136 95 80 20 140*63*75 Product Display Other shape of silk lantern If you have any questions, please feel free to contact us. Thank you! If you want to customize your logo or package, the MOQ will be 500pcs. If more than 200pcs, shipping by sea freight is cheap and safe. If you need to customize your logo, we will charge you some samples fee. 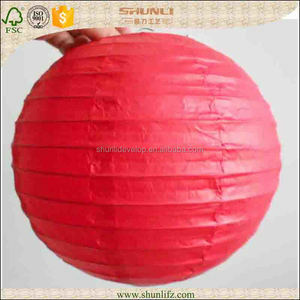 1 YRS Shanxi White Moonlight Crafts Co., Ltd.
8 YRS Yiwu Luckygoods Handicraft Co., Ltd.
2 YRS Zigong Haitian Culture Co., Ltd.
-Design: Design the specific lanerns according to the location of lanterns on site, themes and client's requirements,etc. -Manufacture: We will manufacture the most part of the lanterns in our factory after confirmed the designs. -On Site Manufacdture and Installation: Huge lanterns need to be manufactured onsite with shipped materials. 4 YRS Fuzhou Nicrolandee Arts & Crafts Co., Ltd.
2 YRS Jianou Fulin Arts & Crafts Co., Ltd.
3 YRS Shu Xi Ying Cultural Communication (Chengdu) Co., Ltd.
1 YRS Yiwu Dreamlight Crafts Co., Ltd.
W:25KG 50CM: 50pcs/carton Carton size: 102*52*67cm G. W:22KG 60CM: 30pcs/carton Carton size: 102*52*67cm G. W:22KG 80CM: 16pcs/carton Carton size: 102*52*67cm G.
12 YRS Xiamen Honfetion Commerce & Trade Co., Ltd.
1 YRS Shijiazhuang Yushuiyan Commerce and Trade Co., Ltd.
1 YRS Xulang Trading (Shanghai) Co., Ltd.
2 YRS Yiwu Joy Crafts Co., Ltd.
1 YRS Zigong Boyun Cultural Transmission Co., Ltd.
Each of them is crafted with high-quality material and are best used for decoration . They are suitable for home decoration, party decoration, wedding decoration, outdoor decoration. Also we can help you choose the one which is right for your needs. 10 YRS Xi'an Meilun Art & Crafts Co., Ltd.
Doesnt come with a light. 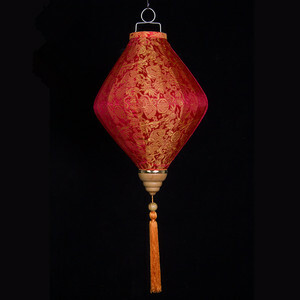 You could use a battery operated remote control paper lantern light for it. It comes with a sturdy frame that will hold a light bulb also. 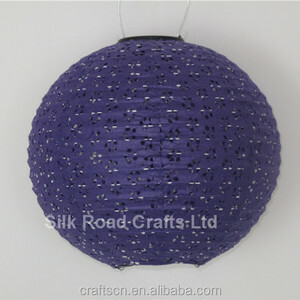 2 YRS Jiaxing Vickyi Homewares Co., Ltd.
Alibaba.com offers 503 hanging fabric lanterns products. About 41% of these are event & party supplies, 10% are other holiday supplies, and 10% are chandeliers & pendant lights. A wide variety of hanging fabric lanterns options are available to you, such as event & party supplies, lantern. 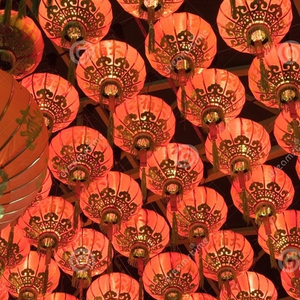 You can also choose from chinese new year, new year, and wedding. As well as from party decoration, party favor, and noise maker. And whether hanging fabric lanterns is free samples. 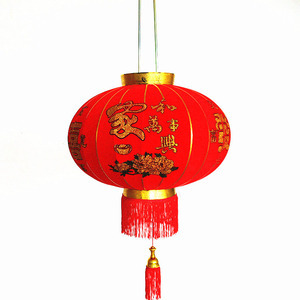 There are 503 hanging fabric lanterns suppliers, mainly located in Asia. 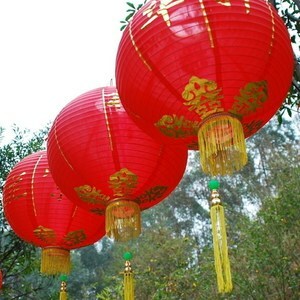 The top supplying country is China (Mainland), which supply 100% of hanging fabric lanterns respectively. 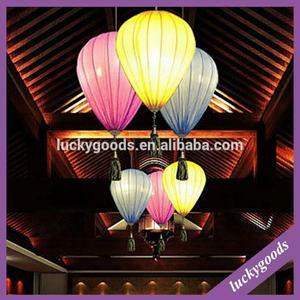 Hanging fabric lanterns products are most popular in North America, Western Europe, and Northern Europe. You can ensure product safety by selecting from certified suppliers, including 73 with ISO9001, 58 with BSCI, and 22 with Other certification.